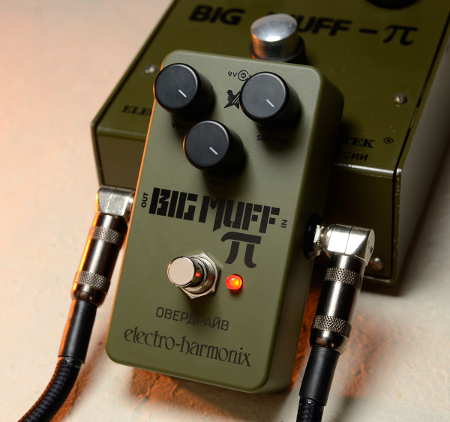 Electro–Harmonix announced today via email that it's bringing back a cult classic from its storied fuzz history: the Green Russian Big Muff of the mid–'90s. This new model follows current industry trends by shrinking the enclosure down to the same dimensions of other popular pedals like the EHX Soul Food. First introduced in 1994, the original Green Russian was built as part of EHX's Sovtek operation. It's also referred to as the "Bubble Font" and "Tall Font" Big Muff depending on the chassis's specific graphics. Sonically, the Green Russian is similar to other Sovtek–era Muffs in its grit, but it’s known to offer a little less gain with a fatter bass response — at least with the "Bubble Font" iterations. A smoother top–end makes things less fizzy, and overall, this particular Muff has proven a popular choice with bass players. As is the case with most Sovtek–era production models, individual specimens vary significantly, and it'll be interesting to see exactly where this new model lands on the spectrum of Big Muff tone. While this is the first time Electro–Harmonix is reissuing this pedal, a number of other boutique brands have designed pedals based on the Green Russian in recent years. Examples include the Musket from Blackout Effectors, the GRM Fuzz from Stomp Under Foot, and EarthQuaker Devices' popular Hoof Fuzz.